Upon first hearing about this film, I was completely disgusted at the direction the film industry is going. If not ruining already successful franchises with unecessary sequels, they go and make a film out of any old rubbish- such as Facebook, Monopoly, or even Battleship. I have found that this wasn't the case with The Social Network. The basis of the film is this. After his girlfriend (Rooney Mara) breaks up with him, Mark Zuckerberg (Jesse Eisenberg) creates Facemash, a site which allows people to compare and rate girls from their university (Harvard, of course) based on their "hotness". This of course creates a craze despite getting him into trouble with the school. 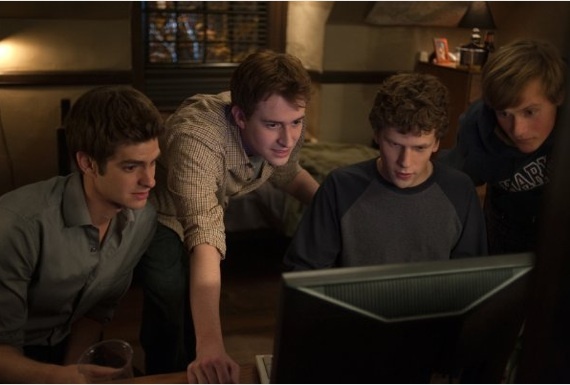 Twins Cameron Winklevoss and Tyler Winklevoss (both Armie Hammer) approach Mark about being part of their site idea Harvard Connection as a programmer to which he agrees, but instead finds his friend Eduardo Saverin (Andrew Garfield) to launch their own site, "The Facebook". 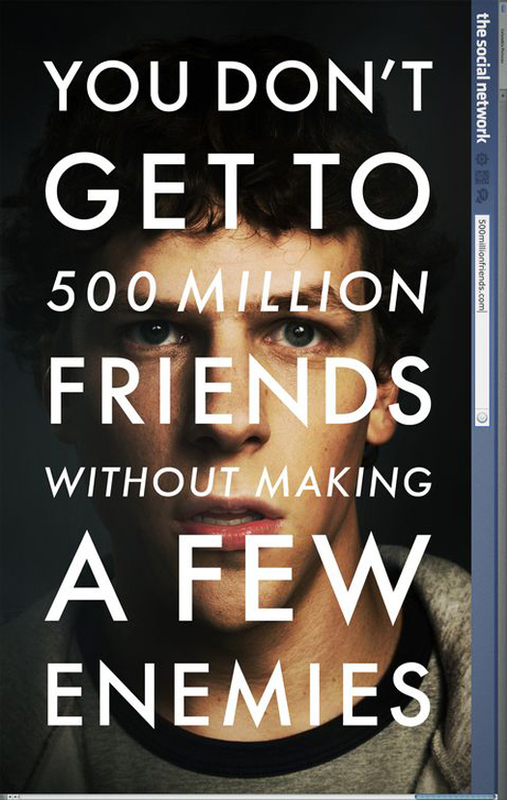 Whilst you might expect this film to chronicle the creation of Facebook, it does so in a way that isn't just for people who understand their computer jargon. 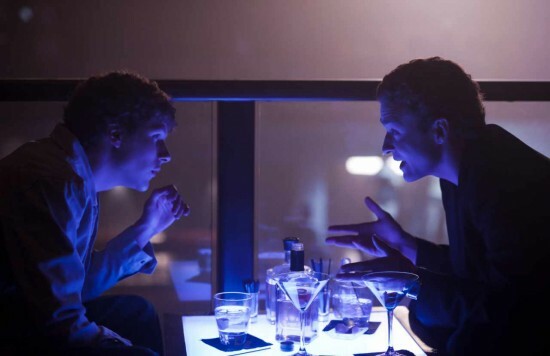 Truncated and Episoded through two lawsuits (one by the Twinklevoss brothers and one by his best friend Eduardo), the story is retold from different people's perspectives: Mark, Eduardo and the Winklevoss twins. In this way, the film isn't just about the creation of the popular social networking site- that part I found incredibly boring, it is about friendship and how you can be driven by pride or jealousy to do things you wouldn't normally do and to be influenced or corrupted by the people around you. This aspect of the film surprised me and is what I found to be most intriguing, unenjoyable, but intriguing. The deeper messages of the film come through, despite being set against such yawn-inducing story. Personally, not being American or involved at all in the creation process, I feel somewhat detatched to the events as a normal regular user of the site. Perhaps had I been one of the first to use it/witness the phenomenon, this film would have more impact on me. I found the character Jesse Eisenberg plays to be extremely annoying. 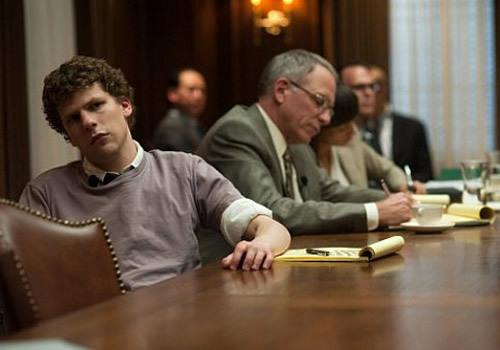 Whether real life Mark Zuckerberg is like this, I don't know. Is he really that socially inept? The opening seen with him and his girlfriend just made me so frustrated and was pleased she broke up with him. Such a douche. Andrew Garfield, who I suppose I primarily watched this for, was much more watchable. Always well-dressed, there were moments where you sided with him and he was very believable. He did have the same expression for most of the "normal" everyday scenes, but when required, he put on a face you believed in. Definitely upcoming. Justin Timberlake plays his usually film role- but get back to the music where you belong- whilst Rooney Mara was given like two scenes which really does not show her acting ability, which I'd like to have seen more of given she will be the lead in the English film adaptation of The Girl with the dragon tattoo. As a film that dragged on for two hours, it isn't successful, but several themes are meaningful (friendship/corruption etc) as well as making this film so that the general public can enjoy is a good feat. The humanisation of the whole thing is interesting. I wouldn't go see it again or recommend it - I found myself switching off most of the time... I'll stick to using the site, and just be pleased it exists.